Following heavy downpour on Monday night, the Lokpriya Gopinath Bordoloi International (LGBI) Airport roof in Guwahati was caught leaking. Monday night’s heavy downpour caused a shower inside LGBI Airport here as rainwater leaked through the roof. A report appearing in the The Telegraph stated that airport officials were left red-faced as water pouring through the roof went viral. The report further stated that as heavy rains lashed the city, passengers and airline staff inside the airport felt the impact as the roof at the airport’s departure area started to leak. The X-ray baggage scanning machines got a drenching while passengers and airline staff ran for cover. They were taken aback to see water drip from the roof and make a puddle on the floor. According to the Meteorological Department, Borjhar area, where the airport is located, received 94 mm of “heavy rainfall” between 8.30 pm and 10.30 am on Monday. Raj Gogoi, a city-based marketing executive, said, “This is an extremely sorry sight. 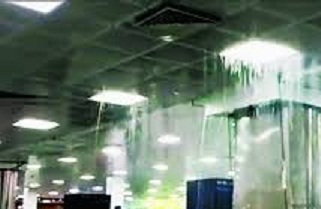 I have never come across a leaking roof in an airport.” He probably had not seen Kolkata airport in June, when a heavy downpour sprung multiple leaks in an extended section of the domestic terminal. It may be mentioned that the LGBI Airport was renovated ahead of the Global investors’ summit, Advantage Assam, held here in February this year. A statement issued by the Airports Authority of India (AAI) on Tuesday said the airport’s roof drain overflowed due to intense downpour on Monday night. It said the water leaked through the roof as the drain between the erstwhile canopy, which is now enclosed on the city-side expansion and the terminal building, could not accommodate the run-off water of the catchment roofs. “Normalcy was restored within an hour by cleaning the floors. No passenger movement and flight operations were affected,” the AAI statement said. “To prevent recurrence of such incidents, corrective measures have been taken on a war footing. All concerned at Guwahati airport have been instructed by AAI regional headquarters to carry out checks as per the standing instructions of AAI,” the statement said. The AAI said the airport has not witnessed such an incident in the recent past.